This was a collaborative project with Eugene Chabourne and others. In 2000, Eugene re-issued it as a CD-R on his own House of Chadula label with 20 minutes of additional material from the same sessions. New songs are: "The List is Too Long (slight return)", "Imitation of Astral Traveling", and "Xmass Song." This edition comes either in a jewel box or hand-packaged in a xeroxed piece of construction paper. 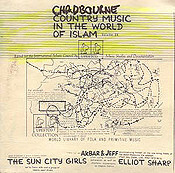 There were also other volumes in the Country Music in the World of Islam series, all issued on cassette, and some dating to the mid-'80s. There were two in 1996: Country Music In The World Of Islam 17-18 featured members of Camper Van Beethoven, and Country Music In The World Of Islam 33-34 featured the Campers, Boiled in Lead, and an improv recorded in Oxford.